Your Upcycling Project – Where to Start?! Written By Michaela, Paint for Fun’s artist and our inspiration to reuse and substantial art practice. In fact I love hard rubbish and I’m not ashamed to admit it! Hi, I’m Michaela and one of my biggest passions is to collect, renovate and use hard rubbish gems – to transform it into a useful beautiful satisfying thing. My niece just celebrated her 2nd birthday, and what a wonderful reason to embark on a new Upcycling project! 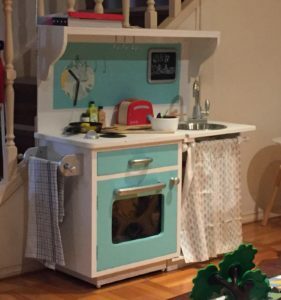 A quick check with her mum produced an ambitious idea: let’s build her a little kitchenette! When you have an idea but don’t know how to go about it, I suggest looking at other DIY enthusiasts for answers. One of the best ways to learn new skills, form a new project or just get inspired is to have a look at tutorials on YouTube, Pinterest, or any other platforms that your heart desires. It does take time and effort to know what you are doing, and the first attempt is always hard, but let me tell you: there is nothing more satisfying than that moment when things starting to look just great and even better satisfaction comes when the project is done, and you get to enjoy the results! The second step is to plan your project: a quick sketch will do. No need to be an architect to draw some general visual idea on a paper. The third step is to collect your hard rubbish! You will be amazed of how many wonderful materials you can find on the side of the road. Praying for the hard rubbish gods doesn’t hurt but most importantly: keep your eyes open! The final step: get cracking. You may need some tools like: Sews, hammers, drillers, nuts, paints etc. Bunnings is like the Disneyland of DIY lovers and their staff always like a challenge so bring your sketch with you and find that helpful person to get you what you need..
It’s your creation, its good for the environment, and you will forever enjoy the hard work and appreciation from the loved ones! Hope this make you all excited to start that project you’ve been over thinking about and please share your ideas and comments with us! We will love to see what you have made and any tips you want to share.